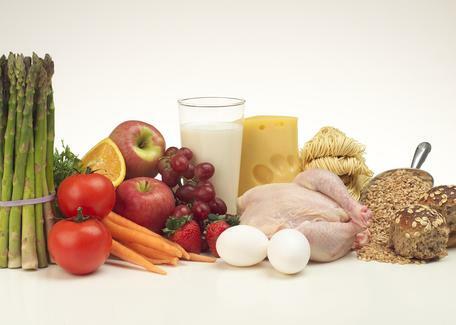 3.2 Food is a biofuel used by organisms to acquire energy for internal living processes. Food is composed of molecules that serve as fuel and building material for all organisms as energy stored in the molecules is released and used. The breakdown of food molecules enables cells to store energy in new molecules that are used to carry out the many functions of the cell and thus the organism. 3.4 Energy flows through food webs in one direction, from producers to consumers and decomposers. An organism that eats lower on a food chain is more energy efficient than one eating higher on a food chain. Eating producers is the lowest, and thus most energy efficient, level at which an animal can eat. 3.6 Humans are part of Earth's ecosystems and influence energy flow through these systems. Humans are modifying the energy balance of Earth's ecosystems at an increasing rate. The changes happen, for example, as a result of changes in agricultural and food processing technology, consumer habits, and human population size. The continual input of energy, mostly from sunlight, sustains the process of life. Sunlight allows plants, algae and cyanobacteria to use photosynthesis to convert carbon dioxide and water into organic compounds like carbohydrates. This process is the fundamental source of organic material in the biosphere. There are a few exceptions to this, such as ecosystems living around hydrothermal vents on the ocean floor, which derive their energy from the chemical compounds such as methane and hydrogen sulfide. In either case, the overall productivity of an ecosystem is controlled by the total energy available. 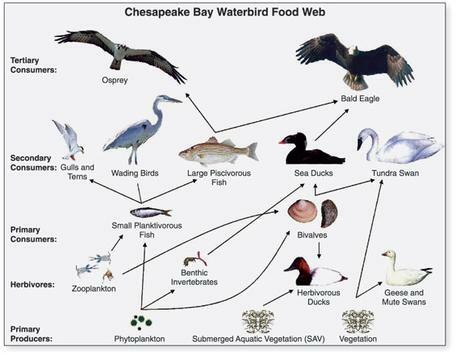 Diagram of a food chain for waterbirds of the Chesapeake Bay. Image from US Geological Survey. This points out a critical factor in the distribution of energy in human foods too. Eating producers (plants) at the bottom of the food chain is the most efficient way for humans to acquire energy for living. This has implications for humans as we strive to keep a growing human population adequately nourished. While many students can readily relate to the idea of the terrestrial food web, the marine food web may be less familiar to them. Students may be surprised to learn that about half the Earth's primary productivity of organic material comes from the oceans. examining various impacts to the energy balance of ecosystems, such as fires, disease, population dynamics, and changes in land use. A variety of foods, each with its own embodied energy and environmental footprint. Compared to Energy Principles 1 and 2, this principle is more concrete and easier to visualize. We all have direct experiences with different types of foods. Many of these concepts, such as how sunlight drives photosynthesis and food webs, are commonly taught in middle school and high school curricula. Educators can take these opportunities to tie in an energy theme with these topics. A quantitative approach can be used to examine the energy embodied in different types of foods. Here are some examples of activities that do this. How Much Energy is on my Plate? leads students through a sequence of learning steps that highlight the embedded energy that is necessary to produce various types of food. leads students through a sequence of activities that highlight the embodied energy that is necessary to produce various types of food (high school or introductory-level college). The Lifestyle Project challenges students to dramatically lower their energy use, and adopting a vegetarian diet is one of the paths that students may elect to take. This project can be used with middle school through college audiences. A hands-on way to teach these topics is from the point of view of a meal or a community garden. All of the concepts contained in this principle can be illustrated in a garden that produces food. To Boldly Go... is a web-based activity tackles the broad reasons for undertaking ocean exploration - studying the interconnected issues of climate change, ocean health, energy and human health. Students examine the types of technology ocean scientists use to collect important data. The video The Ocean's Green Machines further explores the marine food web by examining phytoplankton. These organisms form the base of the marine food web, are the source of half of the oxygen on Earth, and are an important means to remove CO2 from the atmosphere. This video is suitable for a middle school or high school audience. Inland Fish and Warming Waters is an activity that relates water temperature to fishery health within inland freshwater watersheds. World of Change: Amazon Deforestation is a series of NASA satellite images taken over a 10 year period, 2000-2010, showing the extent of deforestation in western Brazil. Stressed Out! is an activity where students research various topics about ocean health, such as overfishing, habitat destruction, invasive species, climate change, pollution, and ocean acidification. An optional extension activity has instructions to create an aquatic biosphere in a bottle and then manipulate variables. Food webs are commonly taught with concept maps, such as with the Oceanic Food Web. The concept map-like connections on this visualization encourage students to link the abiotic and biotic interactions within the oceanic food web. This is also suitable for introductory college students. Fermentation in a Bag and Bioprospecting for Cellulose-degrading Microbes are two hands-on activities that explore the production of cellulosic ethanol. How Much Energy is on My Plate? leads students through a sequence of learning steps that highlight the embedded energy that is necessary to produce various types of food. Students start by thinking through the components of a basic meal and are later asked to review the necessary energy to produce different types of protein.This activity may be paired with The Lifestyle Project. The Effects of El Niño/La Niña on Phytoplankton and Fish video illustrates the effects of climatic cycles with phytoplankton populations. Phytoplankton form the base of the food web and supply half of all the oxygen that we breathe. Energy Economics in Ecosystems What powers life? In most ecosystems, sunlight is absorbed and converted into usable forms of energy via photosynthesis. These usable forms of energy are carbon-based. Ocean Productivity The purpose of this website is to provide the science and broader communities with global, updated ocean productivity estimates. Campus Farmers The site offers a wealth of information and links to resources about starting an on-campus farm, managing farm finances, and staying in business.